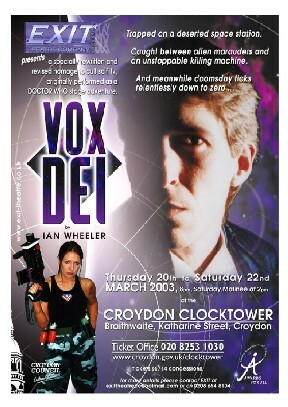 Vox Dei was the first production performed as an original Dr. Who production by the Battered Suitcase Theatre Company at the New Theatre Royal in Portsmouth, April 2001. We are told it was a storming success with both Sci-Fi and non Sci-Fi fans alike. When EXIT decided to look for a suitable Sci-Fi play to stage, the prospect of anything Dr Who-ish was irresistible. What impressed us about the play is that the writer has managed to link elements of Sci-Fi that makes it an endearing genre to us, the dead-pan seriousness with which the actors deliver frankly ridiculous lines, the hanging on to the set and shaking about to denote a problem with the thrusters and the bunch of misfits with the 'never say die' attitude, to name but a few elements. Alongside excellent 'baddies' and a plot that races forward with a frightening momentum. “The Exit Theatre Company gave a stellar performance….. ”. “…..Very different and very ambitious by bringing science-fiction to the Live stage”. “The play combines live action with amazing CGI sequences giving a new dimention to live performance”. “A rattling tale of derring do……… derived from an amalgam of classic Sci fi yarns. I found a wary respect growing for Amanda Lockerbie’s raging feminist, Captain Jet Turbo, whom I would think twice about crossing over a domestic tiff, much less a matter of life and death”. “Mark Vinson, armed only with his trademark golf putter and a modest aplomb worthy of Hugh Grant, fought off a fierce Michael Louca as the War Chief, Deathbane, and his soulless killing machine, the Chimera, played with snarling frenzy by Rawle Ramnath”.